CONTACT THE SPCA FOR ANY DOG CONTROL ISSUES AT: 315-454-0928. My neighbor’s dog barks constantly and the noise is so loud that I can’t sleep or rest when I’m at home. What can you do about it? Chapter 98 of the Lysander Town Code prohibits dogs that “Engaging in habitual and continuous loud howling, barking, crying or whining so as to unreasonably annoy other persons”. If you believe this to be the case, you must file a formal complaint with the SPCA. We always recommend as a first step to talk directly to your neighbor and let them know your concern. Most times these types of issues can be worked out between conscientious neighbors. An unleashed dog was roaming through my yard, and without warning or provocation the dog bit my child. When I tried to catch the animal it ran away. What should I do? First, seek medical attention for your child and then call 911 to report the incident as soon as possible. This animal is a direct threat to public safety and requires an immediate response from police. If possible, write down all pertinent details for police such as time of attack, where attack occurred, type, size and color of dog, direction dog was going and any other information that will help police locate and seize the animal as quickly as possible. The SPCA is not an emergency response function; however, if the dog is licensed, the Town Clerk's Office can assist in locating and contacting the dogs’ owner(s). I found a dog on my property that appeared to be lost or abandoned. The dog did not have any identifying tags or a collar. What should I do? Call the SPCA at 315-454-0928. I spotted a dog roaming through my yard and I’d like to report it. Who should I call? It is unlawful for a dog to freely roam about without a leash or owner close by. Call the SPCA at 315-454-0928. I recently moved to Lysander but my dog was licensed in the town where we formerly lived. Do I need to do anything in Lysander? Yes. 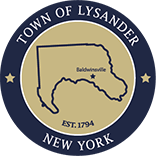 Dogs that have been licensed in another NYS jurisdiction and move to Lysander must now be licensed in Lysander. You need to license the dog at the Town Clerk’s office. The Clerk’s office is open Monday thru Friday, 9am – 4:30pm. The phone number is 315-638-0224. More information is available on the website at the Town Clerk’s page. My friend moved and could not take his dog to his new home. He gave the dog to me and the dog is already licensed in the Town of Lysander. Do I need to do anything? Yes. According the Lysander Code Chapter 98, “No license shall be transferable”. Upon the transfer of ownership of any dog, the new owner should apply for a license for the dog within 10 days after the date of transfer. Please contact the Town Clerk’s office for details on licensing the dog. I took my child to the park to play and there was an individual there with his dog. The dog was unleashed and was running around chasing a Frisbee. Isn’t this against the law? Not really. If the dog is licensed in Lysander and the dog is “Accompanied by its owner or other responsible person and under such person’s full and immediate control by voice command”, then it is permissible by law as long as there is no threat to public safety. However, good judgment from dog owners is necessary because children need to be able to play in our parks without fear from dogs running unleashed near play areas. If a dog is not spayed or neutered the cost is $15.50. The Town Clerk will issue a license if you have proof that the dog has valid rabies shots. The license is renewable each year as long as the dog’s shots are current. Please contact the Town Clerk’s office at 638-0224 or visit the Town Clerk's page for more information. I hope Lysander residents find this information useful. If you own a dog please take a few minutes to read Chapter 98 of the Lysander Code so you understand what is expected from responsible dog owners.